When I’m not working, I’m… spending time with my 3-year-old son. Also, kayaking, mud runs, gardening, mosaic and camping. 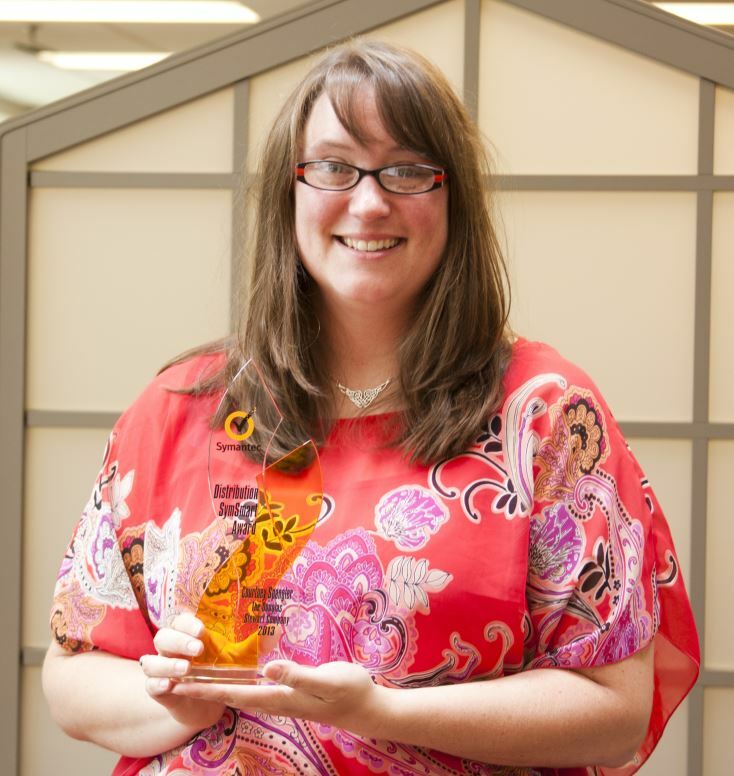 Meet Courtney Spangler, Licensing Specialist at The Douglas Stewart Company and winner of the Symantec Distribution SymSmart award at the 2013 Symantec Sales Champ Training in Las Vegas. Courtney was nominated because she has a loyal base of SLED partners that rely on her experience with licensing and channel programs, and she currently holds over two dozen SSE and two SSE+ accreditations for volume Symantec products. Additionally, she helped Symantec create the easy-to-sell SymEd bundles which have helped drive over $500K in SymEd revenue through The Douglas Stewart Company since the program started in FY13. We recently sat down with Courtney to ask her a few questions about the award. VARCONNECTION: Congratulations on your award! Can you tell us a little bit about how you earned this recognition? Courtney Spangler: Sure – simply put, I help our customers navigate Symantec’s education programs, so they can close end user sales efficiently and confidently. Between me and David Hafner, our partners know they can come to us for comprehensive expertise on all things Symantec. VARCONNECTION: What education programs can you help with specifically? Courtney Spangler: I have a long history of working with Symantec and have weathered many changes in their reseller programs, so there are few questions I haven’t heard before. I also have an especially strong knowledge of the complexities of the SymEd Bundles because I helped develop that program. Understanding and using the bundles in the SymEd program is crucial for selling to education customers. I can also help resellers make the most of Symantec’s Margin Builder and Opportunity Registration programs, so they can bring more revenue to the bottom line. VARCONNECTION: Anything else our reseller partners should know about you and your team? Courtney Spangler: We’re here to help! Please don’t hesitate to reach out to us at symantec@dstewart.com with your Symantec inquiries, and we’ll send you a quick and friendly reply.